Creativity is born, grows, reproduces... and never dies. Fan of the 90s, almonds, and horror movies. Learning the magic of digital transformation day by day. Traditional retailers tremble when they hear talk of the new Consumer 2.0, a type of shopper who regularly makes 30% of his/her purchases via mobile devices. Does this mean that physical stores are destined to disappear? Well, not exactly, because 40% of those online sales are made after having visited a store. So where is retail headed? The future is not as uncertain as it may seem, but retailers will have to make significant changes and learn to embrace new technology. Physical stores cannot and shouldn’t try to compete with e-shops. Instead, they need to transform their sales channel to offer unique shopping experiences. For several years, the famous LEGO toy brand has been doing just that with its “digital box”, an interesting augmented reality (AR) kiosk set up in stores where customers can scan a product and see a 3D image of what the model will actually look like when built. Another more recent example is the American chain Lowe’s, which has bet big on cutting-edge technology by launching a new kitchen design tool, Lowe’s HoloLens. While standing in a showroom kitchen, customers can see their ideas come to life in holographic form and try different arrangements before making a final decision. But what about the textile industry? Will clothing stores really be as futuristic as we imagine? 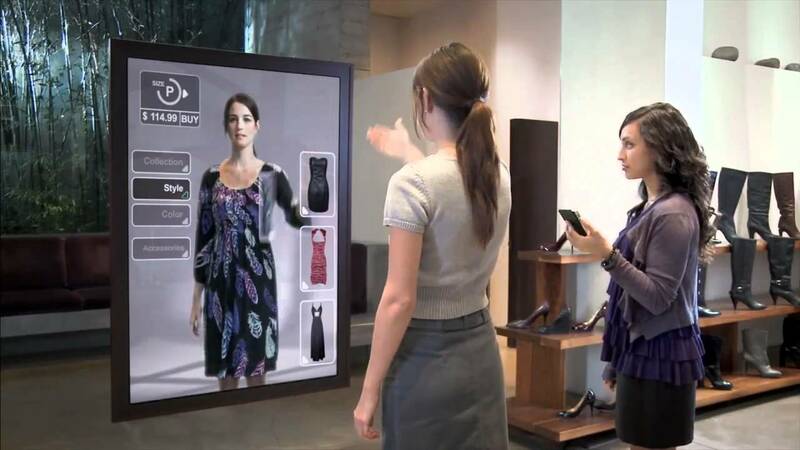 According to an IBM report, by 2025 clothing inventory and stock will be reduced, and stores will be more like showrooms where we can create and try on as many outfits as we want in real time. In light of this prediction, many fashion companies having taken on the challenge of efficiently combining their physical and digital shopping experiences. How? By reinventing themselves. The latest innovation in this field is Data_Dress, a new customized clothing design project launched by Google and the H&M brand Ivyrevel. This technology comes up with unique designs based on the wearer’s daily activities and lifestyle, which are monitored for a week by means of a simple app. According to the firm, it’s already being tested by “early adopters” who will receive their bespoke designs next month for a price starting at $99. The revolution of the digital world is changing the way we communicate, shop, and relate on a daily basis. But instead of focusing exclusively on online sales channels, we need to realize that the true challenge is learning to work with new offline formulas and changing how we interact with flesh-and-blood customers to offer them a special, unique, customized shopping experience. Are you up to the challenge?